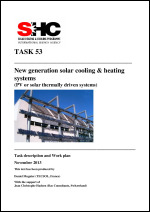 The results of past IEA SHC Task 38 Solar Air-Conditioning and Refrigeration and ongoing IEA SHC Task 48 Quality Assurance and support Measures for Solar Cooling systems on the one hand showed the great potential of this technology for building air-conditioning, particularly in sunny regions. On the other hand, it has been shown that further work is necessary in order to achieve economically competitive systems, using either the solar thermal or the solar photovoltaic driving energy. One Task definition workshop has been held with the aim to define the required new activities and to develop a structure for a new Task entitled „ PV and solar thermal driven cooling & heating systems “. Stimulated by the rising cooling demand in the World and at the same time a very significant PV modules price decrease, an important interest for new generation solar cooling systems has arisen. At the same time, solar thermal cooling technology still suffers from an important lack of competitiveness due to a very small market size and difficulties to go to massive cost reduction at least in the small system (<50 kWcooling) range. Besides, the solar photovoltaic source coupled with compression technology (heat pump) presents a very promising alternative but is still in its technical infancy.